In autumn, the tree leaves are turning from a green to deep red and bright yellow: a real explosion of colors! This is what we call ‘ruska’ in Finnish. Add this to the morning mist on lakes and rivers, autumn sun beams, and you get one of the most amazing shows from mother nature! Your camera is a must have to capture those unique moments. 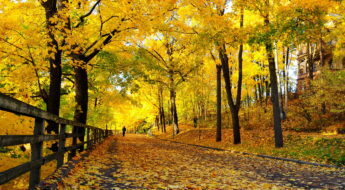 During September, the ‘ruska’, lasts for more or less 2 weeks. We recommend the middle of the month if you want to experience the best of it in Lapland. Autumn colors in #Lapland. Picture by @ninadenapapiiri. 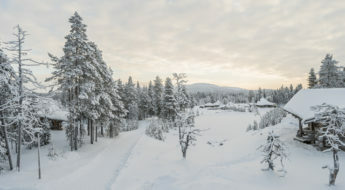 To help you in your trip planning, we picked up 3 top destinations in Lapland to live this exceptional time of the year. Near the ski resort of Salla, in the Eastern Lapland, the Tuntsa wilderness area is ideal for hiking thanks to its accessible and easy terrain. The wilderness area is only a small piece of the larger Tuntsa region, and it offers plenty of routes to explore. For example, the Urho Kekkonen Hiking Trail will take you through Tuntsa wilderness area and offers a great number of views on the open landscapes of Lapland. The easiest was to explore the area is by following this trail. It is the best way to get familiar with the Lappish nature and landscapes. For more experienced hikers, the region is offering the opportunity to go off-trails. To get the most out of your trip there, we advise you to stay 3 to 4 days. To stay in the Tuntsa area, check out all the cottages around the Salla Ski Resort. Our tip: You will certainly see many reindeer during your hike, but if want to learn more about reindeer herding and culture, we recommend you to visit in the Salla Reindeer Park. Fell Lapland (‘Tunturi-Lappi’ in Finnish) is a large region gathering the communes of Muonio, Enontekio, Kittilä and Kolari in the northwest of Finnish Lapland. The presence of several fells chains in the area makes it a perfect destination for hikers, mountain bikers and nature lovers to admire the autumn colors. You will find a large choice of nature paths and trails of various lengths: from 2 km to 69 km for those willing to take more challenging routes. One of the superb marked trails is the one going from the Pallas fell to the Hetta village (55 km). If you are staying in Levi tai Ylläs, Pallas-Yllästunturi National Park is not far away. Only circa one hour by car. Our tip: Head over to the top of Särkitunturi fell to get the most beautiful view of the National park. The starting point of the hiking trail is located at only 15 km from Muonio. The trail is easy and takes less than an hour to reach the top. There you can have a break and enjoy the scenery. In the Sámi culture, the autumn season is a very important period. The reindeer mating season is on, and gatherings are organised to take care of the herds. The lake Inari is the 3rd largest lake in Finland. The nature surrounding this gigantic lake is absolutely unspoiled. It is one of many spots in Finland where you can experience what silence really means. The autumn colors can be seen as well from the water during a canoeing or kayaking trip. The lake and rivers in the region are the perfect playground to spend a few hours or a few days outdoors. Our tip: From the Inari village, take a short boat cruise to visit the Ukonsaari island , a sacred place for the Sami people. From there, you will get an amazing 360˚panoramic view on the lake. Stay in one of our cool wilderness cottages, in the Inari region or pick a nice cottage in Saariselkä. Any other destinations in mind? Share them with us in the comments below!